LIVE ELECTION COVERAGE with Amy Goodman of Democracy Now. If it appears that this election was stolen, you must attend the Voter Assemblies on Wednesday. Go to LibertyTreeFDR.org for more information. Here's why. A 2002 federal law, the Help America Vote Act, requires all states to "coordinate" their voter registration databases with the Social Security database (and state motor vehicle databases) for the purpose of processing new voter registration forms. For the millions of voters who do not have current driver's licenses and register using the last four digits of their Social Security numbers, state election officials are required to try to match their voter registration information against Social Security records. But if the Social Security database is down—as it will be for four days—they won't be able to do that. Across the country, the processing of these voter registration forms will grind to a halt for four days. From the frontlines of the Police State to the darkest sanctum of the secret society that controls it, Martial Law reveals the master plan of a group hell-bent on capturing America today -- and tomorrow the world. Coming up on NO LIES RADIO Super Tuesday Live Election Coverage !! A lot of advice we’re getting from our progressive friends is to take photos of your ballot and silly stuff like that. Well, that’s all about how to complain after they steal it. I have a better idea: Win, don’t whine. The regime’s sneak attack via vote suppression [see, "How They Stole the Mid-Term Election"] will only net them about 4.5 million votes. You should be able to beat that blindfolded. As that will cost about 5% of the vote. That means you can’t win with 51% of the vote anymore. So just get over it. If you can’t get the 55% you need for regime change, then you’re just a bunch of crybaby pussycats who don’t deserve to take charge. Vote today — at early voting stations — so you can spend tomorrow bringing out others to vote. Also, if you’re challenged, you’ve got another day to bring in more ID or scream bloody murder to your county elections board about your missing registration. Arrive with five! Never go bowling, make love or vote alone. And volunteer at get-out-the-vote operations. It’s worth it just for the stale donuts, cold coffee and hot democracy. If they try to hand you a "provisional ballot," scream bloody murder. If there’s a problem with your ID or registration, demand adjudication from a poll monitor, come back with proper ID, or demand appeal to the county supervisor of elections. But don’t just walk away. If it’s provisional or nothing, take it — then return for the count to defend it. 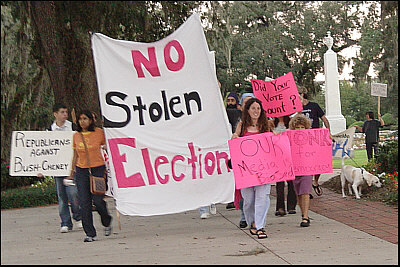 Here’s how the 2006 mid-term election was stolen. Note the past tense. And I’m not kidding. And shoot me for saying this, but it won’t be stolen by jerking with the touch-screen machines (though they’ll do their nasty part). While progressives panic over the viral spread of suspect computer black boxes, the Karl Rove-bots have been tunneling into the vote vaults through entirely different means. On January 1, 2006, while America slept off New Year’s Eve hangovers, a new federal law crept out of the swamps that has devoured 1.9 million votes, overwhelmingly those of African-Americans and Hispanics. The vote-snatching statute is a cankerous codicil slipped into the 2002 Help America Vote Act — strategically timed to go into effect in this mid-term year. It requires every state to reject new would-be voters whose identity can’t be verified against a state verification database. Sounds arcane and not too threatening. But look at the numbers and you won’t feel so fine. About 24.3 million Americans attempt to register or re-register each year. The New York University Law School’s Brennan Center told me that, under the new law, Republican Secretaries of State began the year by blocking about one in three new voters. How? To begin with, Mr. Bush’s Social Security Administration has failed to verify 47% of registrants. After appeals and new attempts to register, US Elections Assistance Agency statistics indicate 1.9 million would-be voters will still find themselves barred from the ballot on Tuesday.